If you have a daughter, take the time to read this. It could save her a lot of heartache. Not to mention stomach aches, headaches, missed days of school, lower grades, eating issues and depression. The sad truth is that every school, whether public, private or parochial, has mean girls. I bet you can still even remember who they are from your school. As a school counselor and mother of three daughters, I know firsthand - both personally and professionally - how much it hurts when girls are targeted by bullies. “Heather” was miserable because a girl in her class, “Leslie,” was not only saying mean things to her face, but getting the other girls in the class to exclude her with the age old line “You can’t be friends with me, if you’re friends with her.” In our sessions, Heather would complain that she didn’t have anyone to play with because girls were afraid that if they hung around her they’d become Leslie’s next target. Leslie had immense influence over the social dynamic among these girls. Ask for specifics when your daughter hints at bullying. Who? Where? How? 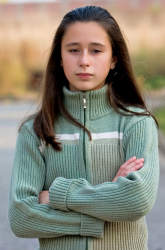 Tell the principal and classroom teacher the specifics of how she is being bullied. Have them tell other teachers (i.e., gym, art, music), recess aides, hallway monitors and cafeteria staff so that everyone who comes in contact with her can be on the lookout and poised to intervene. Explain to her that reporting an incident is not the same as tattling, and have her tell an adult at school when she is being bullied. Encourage her to stick with a friend at recess, lunch, in the hallways, on the bus or walking home because she is more likely to be targeted when she is alone. Teach her to convey self-confidence by walking confidently, with her head up. Bullies target those they think are weaker. Pay attention to how she is sleeping, eating, feeling and doing in school. If you notice changes in any of these areas, have her see the school counselor. Arrange opportunities for your daughter to socialize with her friends outside of school to help her maintain a strong social support system. In Heather's case, these steps alleviated the problem. But because it’s tougher to catch girl bullies, it’s extremely important for girls to tell an adult if they are being bullied. Unlike boys, who usually bully physically, mean girls often spread rumors, whisper as their target walks by, talk loudly about a party she wasn’t invited to, give her the silent treatment, and as discussed above, tell others not to be friends with her. School personnel are there to help, but in order to do anything they must know a problem exists!